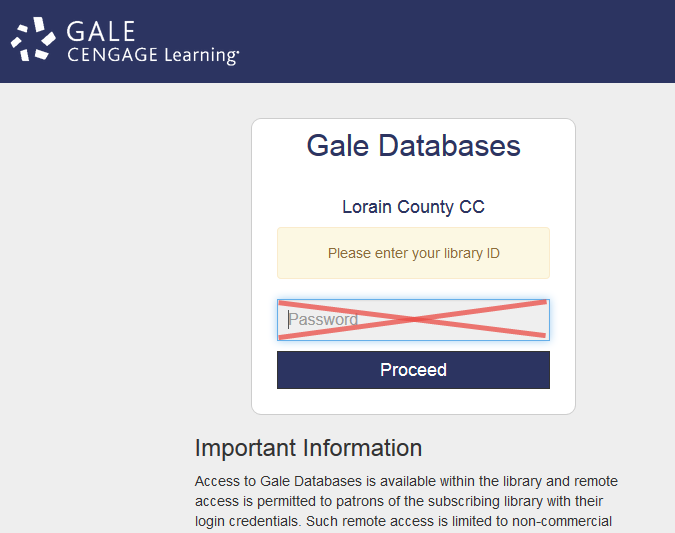 How to access databases and other library resources when you are not at LCCC. Check out books from the LCCC library. Request library items through OhioLINK when not available at LCCC. Use any research database from off-campus. If you do not have a Library ID, or if your Library ID is not updated for the semester, visit the CIRCULATION desk or call (440)366-4026. 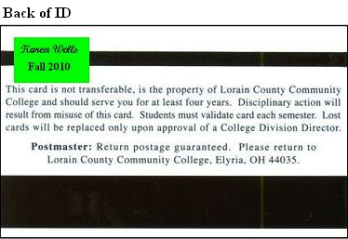 The front of the ID has a 14-digit number above the bar code that you will use when requesting materials through OhioLINK or using research databases from an off-campus location. An updated ID should have a sticker on the back for the current semester. 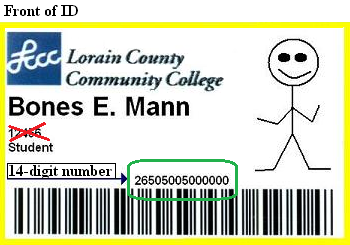 You must currently be registered at the LCCC Library. You have no unpaid fines or overdue material. If you are unsure about your status, review your record at the LCCC Library. Contact the CIRCULATION desk (440) 366-4026 to register and/or handle issues with your record. 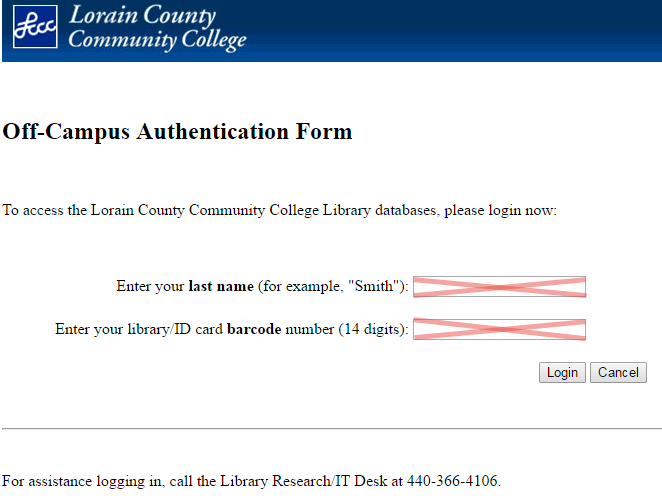 Are you starting at LCCC Library webpages? In order to access databases and other electronic resources from off campus, you need to log in through the library's webpages. Here are examples of login screens for different library systems. You can use any current browser software, such as Mozilla Firefox, Microsoft Internet Explorer, Safari, Opera or Google Chrome. "Cookies" must be enabled on all browsers. Test your browser HERE to see if it accepts "Cookies"
An out of date browser. Most databases work best with Firefox. Cookie settings. Try adjusting your settings or deleting your cookies. Your browser cache. Clearing it may resolve your problem. Firewall interference. Unless certain ports are opened on the firewall, it will block you from accessing OhioLINK databases. See the list of required ports. Contact the network administrator of your business or organization. You may not be able to access library databases from behind a firewall. What if you still can't connect? 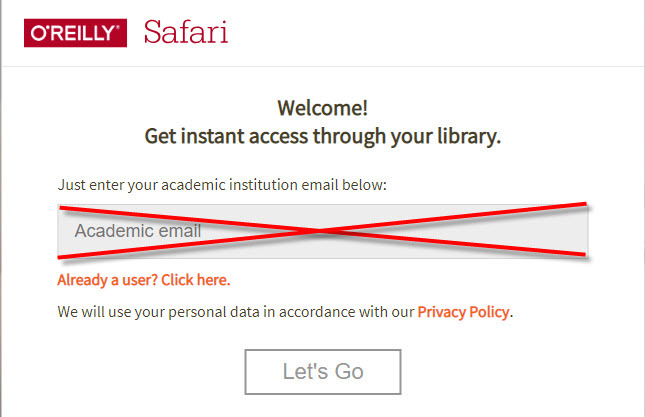 For O'Reilly Safari, you must use a lorainccc.edu e-mail address.